Highway One & Rodney St.
Highway One & Dagsworthy St.
Highway One & Read St.
Highway One & McKinley St. Waves: 1 to 2 ft. The Lighthouse & Cove- An offering of moderately priced seafood dishes with a bay facing bar to catch the best sunsets. Settle in with good friends and a bottle of wine from their great selection! Que Pasa- An instant Dewey favorite since it's open with an outdoor Cantina Bar and dining in the sand! Bring the whole family and don't forget about Taco Tuesdays this summer! The Rusty Rudder- A Dewey Classic, need we say more. In Spring and Fall, the Rusty Rudder is your place for live entertainment hosting band battles like Chickfest, Popfest, and the Elvis Festival to name a few! Nalu- Hawaiian Surf bar offering island inspired casual dining and featuring live entertainment. Be sure to "wipe-Out" while you're there! Surfside Bar and Grill- Where ice-cold drinks come in rounds for you and all your new friends.You'll find tasty eats and a huge bar with plenty of seating and plenty of people. Mama Maria's- Offering not just pizza, but an array of Italian cuisine. Take the family in for an old fashion Itlaian Family dinner, even if youre not Italian! Two Seas- One of Dewey's finest hidden gems offering the only rooftop dining experience in Dewey Beach with breathtaking views of the ocean and exquisite cuisine. Sharky's- Offering breakfast and lunch daily in the center of Dewey. Play beat the clock to make the 10am breakfast cut-off & if you miss it try the Cuban for lunch. Reminder, Cash Only! Grotto Pizza- The legendary taste on the corner of Reed St in Dewey Beach. Fun for the whole family and your place for beer towers! Fifers- Eat Fresh! Breakfast and lunch quick and for $5! Dewey Beach Liquors- The best & only liquor store in town! bring your ID, 21 and over permitted. Northbeach- Party on the bay central. Sunset Funset Fridays are new and a big hit with food and drink specials, free tubing and jet ski rides, and plenty of good looking people sippin on cool Dewey Devils. Come have some grown-up play in the sand with all your friends. A little tip ladies, skip the heels for this one! Ivy- Bay front dining at its best! Bottle & Cork- The greatest Rock n Roll bar in the world, over 50 years and going strong the Cork brings some of the best shows this town has ever seen from George Clinton to Citizen Cope to Bruce in the USA. 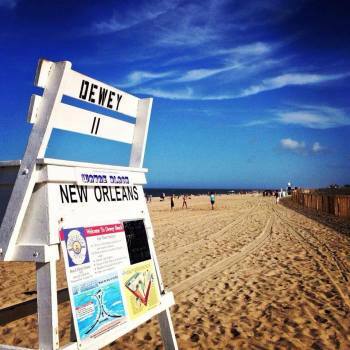 Bringing a rich mix of musical culture to Dewey residents all summer long. Dairy Queen- Satisfy that sweet tooth with a creamy blizzard, now accepting Credit/Debit Cards! Hammerheads- The true locals place to hang. You can always find a friend willing to throw a few back here. Open year-round with trivia on Thursdays to expand your brain while quenching your pallet with delicious food and cold beers and home to a local grown-up Prom every February! Jimmy's Grille- A picnic style feel with open air dining. All your down home favorites like fried chicken and man n' cheese. Live entertainment in the Summer afternoons. Dewey Beach Market- A store with all you need to satisfy your second most important needs in Dewey, everything other than alcohol, ha! Mama Celeste- The rarely disputed champion of pizza in Dewey Beach, turning into a mob scene shortly after last call. A little hint, make friends with Mama and Papa! Salad Factory- A healthy way to dine in Dewey with a cereal bar, fresh fruit, cool wraps, and delicious salads. Try a smoothie to cool down from the hot summer sun and remember, bring Cash! 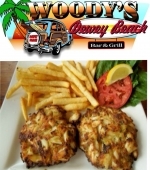 Gary's Dewey Beach Grill- Offering tasty food alternatives like turkey cheesesteaks & vegetarian pasta. Lots of beer on tap and in bottles, a secret spot for the locals to relax with alternative brews and eats! Starbord Raw- Another Dewey beach hide-away great for lunch or dinner great happy hour and nightly specials, Fresh Seafood anyone?! 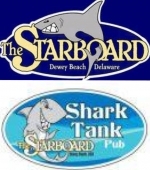 The Starboard- The "heart of Dewey Beach" known for their Suicide Sundays with the largest make your own bloody mary bar, and their huge "parties" for events like opening, closing, and running of the bulls. It's THE destination for weekend and seasonal residents once they hit the town limits. iDewey Black Card holders can use their black card to gain VIP access, priceless! Sunrise- Open all year for breakfast and lunch 6 days a week til 2pm a great place to snag a warm breakfast platter and a hot coffee to nurse that Dewey Devil hang over. BAKED- Serving breakfast and lunch! Breakfast sandwiches, coffee/espresso, smoothies, sandwiches, wraps and salads. Cash only restaurant- but and ATM is available! Rehoboth Bay Boating Club Opening Day... The best way to enjoy life on the water for LESS! For more information email Justin@iDewey.com or call 302 227-7796 ONLY 15 PASSES are available for the entire season! This is the Biggest Event of the Summer.. Take off of work and book your room NOW!! Check Our Facebook Page for more information..
Dewey Beach Fireworks - July 4, 2018. Thank You Highway One..
Dewey Beach End of Season Beach Party - September 15, 2018. This is going to be one good STINKIN weekend at the beach. Here's the schedule: Friday, September 21, 2018 Garlic Gathering & Join us and pick up your VIP Scorecard & Map. Saturday, September 22, 2018 VIP Scorecard & Map can be picked up 11am -2:00pm. General Admission Scorecard & Map can be picked up 11:30pm-2:00pm. 29th Annual Sea Witch® Festival - October 26-29, 2018 Rehoboth & Dewey Beach, Delaware.. This is the weekend we have all been waiting for!!! Opening Weekend & Saint Patrick's Day is on a Friday this year!! Need a green shirt that no one has yet? Click Shop iD on the Top Left of this page.. Located at Dewey Beach & Rehoboth Beach, De 19917 4th Annual Dewey Beach & Rehoboth Beach Bacon Fest, 2 Days Of Bacon Pleasure. For The Love Of Bacon Do Not Miss This Event. Delaware's Original Bacon Fest! Get Your Pass Here-> www.iDewey.com Click Shop iD. Looking for a rental property in Dewey or Rehoboth? Betsey Parrett, Realtor, Rental/Sales Associate at Crowley Realty Inc.
TARAMINO, LEWES- Year Round 3BR, 2.5BA, Fireplace, pool, Large sunroom, W/D. AC min to the beach! 1175/MO 484-888-8134. 1993 Jeep Grand Cherokee, great snow/beach vehicle, good cond., garage kept, 200K+ mi., tagged ‘til 2012, $1700 OBO. Call 302-983-1461. Gorgeous car! Only 6,000 miles, rarely used and garage kept, was voted the 'Sexiest Car of 2006', one of the few ever made, has never been in an accident, 2 seater, stick shift, Please call 302-236-9668 for more info or to schedule a test drive! $17,500 Ask for Terri.